Joseph does not like to feed himself. Anything. Ever. He hates getting messy. He hates risking a mess. He is a perfectionist. I know I already told you this. Do you remember? Well he’s almost 3 and I have tried everything to get him to eat. I’ve tried bribing, coaxing, cajoling, praising…you name it, I’m sure I’ve tried it. Yes, I’ve tried leaving him there until he finishes…he could sit there forever. Yes, I’ve tried rewarding…he’s not interested. Yes, whatever you’re about to say, I’m sure I’ve tried it. I was beginning to wonder if this child would ever feed himself and then a miracle happened. I took William for his well-baby appointment with Dr. Perez earlier this week and I asked her about it. 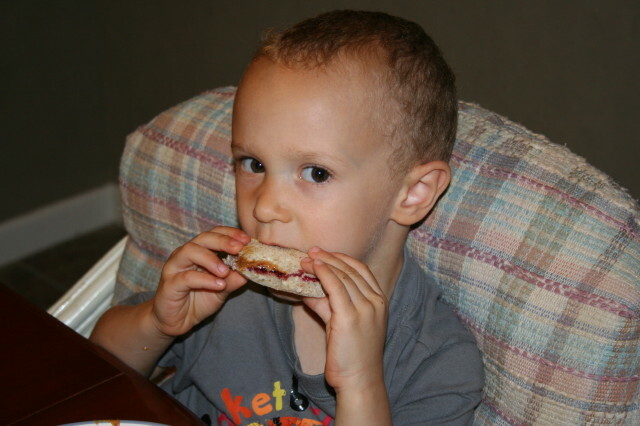 She said, “Joseph’s a big boy…he needs to feed himself.” So I came home and at lunch, I told Joseph, “Dr. Perez says you’re a big boy…she says you need to feed yourself.” And HE DID. And HE STILL IS. And at every meal, he kindly reminds me, “Dr. Perez says I’m a big boy…I need to feed myself.” I guess this Mommy is not an authority on everything. I am so proud of you, Joseph. thank you so much for sharing. What a blessing to have families like yours. Please tell Joseph that I am very proud of him. God Bless!